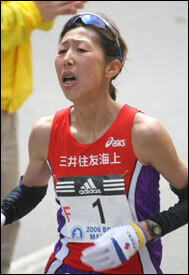 The pain molded itself to Reiko Tosa's face as she flew through Newton with the lead pack of three, approaching the hills. Yes, those hills. And, as she hit them and fell back, everyone knew what to blame. Except Tosa. Bidding to be the first woman from Japan to win the Boston Marathon, Tosa wasn't sure where Heartbreak Hill began. All she knew was that, for one of the few times since they left the starting line, she wasn't in the lead, and the hills were to blame. ''It was a tough race," Tosa said through an interpreter. ''I kept thinking, 'Which were the Heartbreak Hills?' because all of them were tough." Tosa, the prerace favorite and bearer of the No. 1 bib, had to settle for third place, in 2 hours 24 minutes and 11 seconds. She originally planned to run Sunday's London Marathon, but realizing history could be made on the streets of Boston, she switched her plan. Less than 9 miles into the women's race, a lead pack of eight runners had already formed, led for the most part by Tosa. She appeared strong in the cool weather -- though she later said she would have preferred warmer temperatures -- and focused on her strategy of staying out front, which she called a ''spontaneous reaction" to how she felt. As most of her competitors fell back, she continued with that strategy, with first- and second-place finishers Rita Jeptoo and Jelena Prokopcuka, and maintained the pace. Until the hills. ''The course was much tougher than I expected," said Tosa, who had gotten a look at the roads before yesterday. ''I had a good time running until 30K or so, leading the pack, but especially around 35K, I really had a rough time running. ''I did my best, so if I had to run over again, I would do the same tactics. The only thing would be I would train harder to be tougher in the last 5 kilometers." Even though Tosa caught up to the main pack after falling out after the turn onto Commonwealth Avenue in Newton, she really lost it in the hills. She maintained her stiff-armed stride, but her face was an indication of her struggles as she fought up the steep pavement. After expending that much energy in her climb, she was no longer a challenger for the victory. As Jeptoo made her push at Coolidge Corner, with fewer than 3 miles to go, she didn't seriously consider Tosa a threat. Jeptoo said she quickened her pace briefly a few times, testing Prokopcuka, to see if she could match the increased speed. When she couldn't, Jeptoo took off. Tosa, at that point, had little left. She slowed. She faded. She came in third, 33 seconds after Jeptoo, knowing that the hills had claimed another heartbreak.